How do I even begin to describe this book? 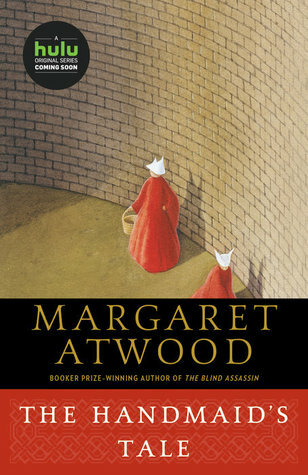 Offred lives in a totalitarian society where Handmaids have little to no rights. It's quite terrifying to read about the laws and restrictions placed upon them. Their lives seem so bleak and dark. This is like a feminist's worst nightmare. The runnings of Gilead made it uncomfortable to read all in one go, no matter how much I wanted to continue. As I came closer to the end, the idea that Offred is a extremely unreliable narrator hit me. She always seems to be withholding information and parts of her story, especially when she says something along the lines of "I don't like to tell this part". I understand the use of pseudonyms, but everything else is quite dubious. Offred is quite the complicated character, because she evokes mixed feelings from me. At times, I admire her daring attitude, but other times I find her selfish and weak. Sounds confusing, right? Well, there are times where it's obvious that Offred doesn't like this new society (as she is one of the first generation women who still remember what it was like before - i.e. our modern society) but she does nothing at all - she submissively accepts her role as a Handmaid. It was this reason that I don't really like her, but I can see why she does it: she values her life and safety above anything else. That's normal though. I think in the end, my favourite is Ofglen. The first Ofglen, I mean. She's against Gilead and does try to tell Offred about Mayday, but in the end is futile. I like her quiet, calm rebellion against Gilead, which is contrasted by the loud and fiery Moira. It was sad to see her ending and it seemed like everything was for nothing. How somber can this book get? The dark plot and morally dubious characters made this book much more of a literary masterpiece. I love this book quite a lot!